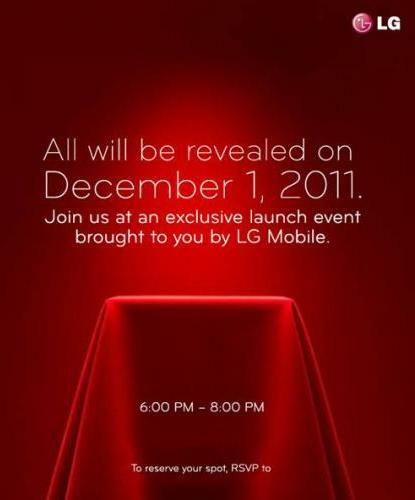 LG has sent out invites for an event where ‘All will be revealed’. The event which is scheduled to take place in New York City on December 1st, can be where LG might show off, the rumoured Nitro HD, which is also known as the LG Optimus LTE. Going in for the features of the Nitro HD, it is said to have a display resolution of 1280 x 720 and will have a 4.5 inch True HD IPS display with a ppi of 329. There’s a 1.5GHz processor and 1GB of RAM. Android 2.3, an 8MP camera is on back while a 1.3MP front-facing camera allows for video calls. With 4G LTE connectivity onboard, LG Nitro HD will also run over HSPA+ network at speeds as high as 21Mbps. Come December 1st and we’ll know it all.